I love spring rolls…probably too much. I also love a good pub treat that you can serve at a game night table. I’m loving this idea of putting anything you want into spring roll form. I mean who hasn’t indulged in the occasional pizza roll? I was introduced to sausage rolls and thought….couldn’t we put a burger in here? So, I figured I would give it a go. I put in some of the things I like cheese burger wise and ran with it. The result is delicious and great for game night, whichever kind you indulge in. In my case it’s board and card games. Keep these in mind for International Tabletop Day if like myself you don’t have a local event to go to. Celebrate with friends and tasty treats! Mix the ground beef and soup mix together. Brown in a pan. Add mustard, ketchup, and pickle to the beef and stir. Layer three phyllo sheets, brushing with butter between the layers. Brush egg white on the top layer. Cut the sheet into columns. I get six. Place a tablespoon of the beef mixture at the bottom of each column. Top with a bit of cheese, make sure you have enough for 12 rolls. Lift the bottom of the column wrapping filling, fold in the sides, and roll up.Click here if you need some visual guidance. It’s not my site but the method is the same. Brush on top with egg white. Place on a lined or greased sheet. Repeat steps 4 and 5 until you have made all twelve and bake for 20-25 minutes. they should look nice a golden brown. Makes 12 omnom worthy rolls. Each roll is 87.5 calories, 4 grams fat, 6.9g carbs, .3 grams fibre, 5.7 grams protein, .1g sugars, 1.7 g saturated fat. 3 SP each or 2 PP for you weight watcher folks. 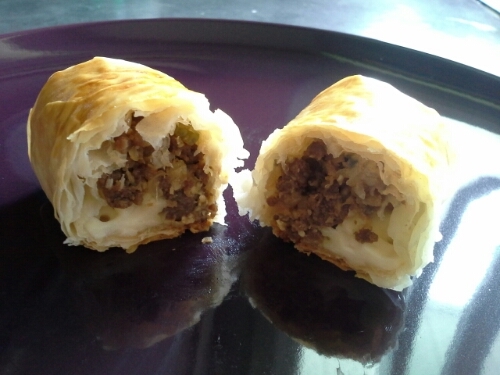 This entry was posted in Comfort Foods, Craving Buster, Snack and tagged Beef, Cheese, Onion. Bookmark the permalink.